Christmas has come and gone so quickly that I can't believe that we are already a few days away from a new year! Christmas day here was pretty low-key. Brett and I had opened our presents on Christmas Eve, knowing that Christmas morning will be all about the Munchkin. And it was. Brett and I have been anticipating and have been overly excited for when the Munchkin walks into the living room to discover the vast amounts of presents sitting under the tree. And even more excited to watch him unwrap his gifts, since this is the first time that he actually understands what presents are all about and is able to unwrap the presents himself. It was quite the moment to watch the Munchkin open his gifts and wanting to play with everything all at once, and so funny when he discovers that some presents are clothing. As for mine and Brett's gifts, well we both didn't really have anything on our want lists (other than yarn for me), and so shopping for each other was a bit of a challenge. Our families on the other hand, gave us little gifts as we let them off the hook (or so we thought) and told them to not buy anything for us, just presents for the little one. In the end we both walked away with some pretty sweet hoodies (I finally got a Sitka one! Thank you my Love! ), and the usual "Christmas pajamas" and "Christmas socks". Presents that really stand out for me is the immersion hand blender that I've been wanting to add to my kitchen gadget collection for a while now, the new What's New Cupcake book which is the follow-up to Hello Cupcake, and the biggest and bestest gift of all: a Tanis Fibre Arts 'Year In Colour' club subscription!! How cool is that?? How was everyone else's holiday? I didn't do any crafting but I did do some baking. I made some utterly yummy Oreo Truffles that my friend Mae had introduced to me earlier this month. I totally forgot to take a photo of them though, but trust me when I say that they were deee-lish! I also baked some madeleines, which was one of my 101 goals. I absolutely love madeleines and had bought a madeleine pan from Williams Sonoma a few years ago but never got around to making them. I think a lot of it had to do with the fact that there are so many different variations out there that I didn't know which one to pick, and knowing my luck I would probably pick the one that tasted like crap. Then another friend, Jennifer (who is blogless!) made some madeleines for last year's Bitchy Bees' Christmas potluck and they were insanely delicious. Jennifer was gracious in sharing in the recipe. I made them before some family members arrived, and even though I thought they could be better, Brett's family gobbled them up. Next time (as in sometime this weekend) I plan on using blanched almonds (I had used natural, which made the little cakes look "grainy", and grind them a little longer for a much finer consistency. 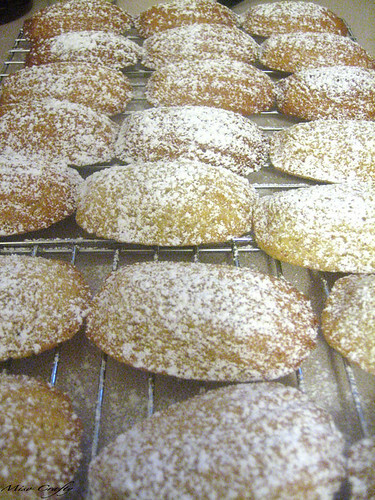 I was too impatient last time and to me the madeleines came out with a very slight crunchy texture. Brett thinks I'm being overly critical of myself (and I probably was) and told me not to worry cause they were really tasty. 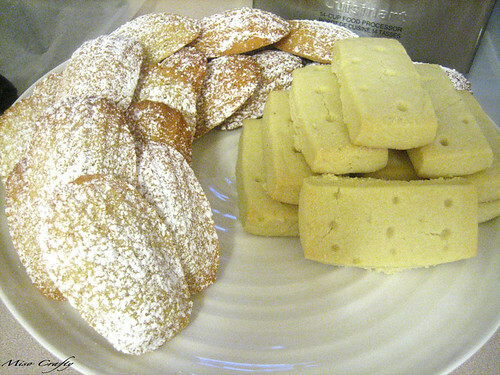 I didn't make the shortbread cookies (I ran out of time!) but I did finally get to use the cake stand that I had bought a few months ago with a gift certificate that I had forgotten that I had. I think in the new year I must bake more so that I could use it more often, it's so simple but makes everything look so elegant! So stay tuned for more baking 'round these parts!